Despite a few hitches, we think the AX 50 USB is brilliant. It´s a genuinely inspirational and useful tool for guitarists - especially those who are also computer musicians. Incredible tracking response. Ultra-flexible. Good, easy-to-use editor. Works standalone too. No Hold function! Some annoying bugs. Flimsy sockets. The AX 50 is a cut-down AX100 that you can connect to your computer via USB. The AX 50's split function allows for boundless flexibility. Convert the sound of your favourite axe into anything you like. WIDI guitar systems still haven't caught on in a big way just yet. The concept is certainly appealing, though: play your trusty axe and allow technology to transform your analogue noodlings into digital MIDI data, which you can then use to control the MIDI instruments of your choice, whether hardware or virtual. 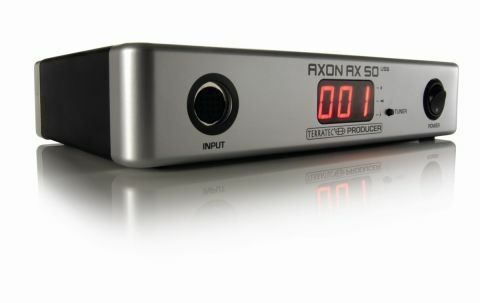 The TerraTec Axon AX 50 USB is a guitar-to-MIDI converter, so to use it you'll also have to buy an appropriate hexaphonic pickup for your guitar and a 13-pin cable. The Axon technology has been around for over a decade now, originally manufactured by Blue Chip, and the classic rackmounted AX 100 has been updated and rereleased in more recent years by TerraTec. The AX 50 USB is the latest in the range, and, as the name hints, it's like a cut-down AX100 that you can connect to your computer via USB. Power is supplied via a wall-wart PSU, however. The software editor is easily installed and you also get FL Studio 6 Express and the Wave XTable sample library, which uses Kontakt Player 2. Load up the editor and you can choose between settings for magnetic and piezo pickups, guitar, bass, violin, cello and different tunings. You can also set the sensitivity of each string and store these settings for up to eight instruments. There are 128 preset slots, each of which consist of one or more 'split zones'. You can route each of the zones to different MIDI channels, as well as any combination of the four virtual MIDI ports or the hardware MIDI port, for easy layering. Each zone can have its own transpose and pitch quantise settings assigned, with the latter determining how string bends are dealt with. You're also able to set volume and pan CCs, as well as three different CCs of your choosing. There's a configurable velocity map, and you can even use the Pick Controller to control any CC in real time, depending on how close to the bridge you pick the strings (the unit can detect this). You're also able to set the tuning of each virtual string, so you can try out alternate tunings without touching your machineheads. Let's get a few things straight before talking about the unit's performance: if your guitar isn't set up correctly, and if your playing isn't clean and precise, then you're likely to run into tracking issues and the spontaneous emission of unwanted notes. You'll also get much better results by either routing each string's MIDI channel (there's usually a channel per string) to its own instrument, or using one that handles 'six-channel mono mode' (such as Poly-Ana). Once you've got it all set up, though, you'll be blown away by the incredibly quick and accurate translation of your playing into MIDI. The Axon technology analyses pick strokes to determine note pitch with minimal latency, so using a pick yields the best results. Chords and regular rhythm playing translate well, bends and vibrato are perfect (very important! ), and hammer-ons and pull-offs work too. Even fast runs and sweep-picking are perfectly feasible, the latter technique working particularly well, in fact. The tracking of tapping and legato playing is OK, though we had to play quite hard to get it happening. There is a mode for playing with fingers, where the pick-detection system is disabled, hence tracking isn't quite as instant, though it's still perfectly playable. For recording, the AX 50 USB is brilliant because you can easily edit out any extraneous MIDI fluff, and for live use, the response is definitely fast and accurate enough, as long as your playing is up to par. You can use the AX 50 USB standalone via its hardware MIDI ports, so you can gig with a hardware synth if you don't want to take your computer along. Speaking of sockets, those for the 13-pin cable and MIDI connections are too flimsy for our liking, though construction is otherwise solid. And while the lack of the AX 100's arpeggiator is no great loss (many soft synths have their own), we do really miss its awesome Hold feature, which enables you to accompany yourself by using a footswitch to 'hold' the current sound while you wail over the top of it with a second patch. One big drawback of the AX 100 is that its hardware MIDI ports are unavailable for normal use when the editor is active, which sort of defeats the point of it. The AX 50 USB's virtual MIDI ports overcome this issue, and that alone could be enough to see some AX 100 users make the switch. In use, we found that the pick split system could result in hung notes when we played in two zones at once. Also, the sending of default CCs is sometimes more of an annoyance than a help, and disabling sending of volume commands doesn't work - it sets the volume to zero instead! We hope these issues are fixed soon with a firmware update. The supplied Wave XTable GM sample library is OK, but it's a bit, well, 'GM'. Most of the patches don't sound that realistic, and so are even less convincing when you play your guitar licks through them. Also, the drum kits are mapped to standard GM notes, which isn't very guitarist-friendly, and the bass patches have to be dropped down an octave, too. We had much more fun controlling our soft synths. Overall, though, we had a great time playing with the AX 50 USB. The tracking is superb, and the many options of the unit itself coupled with the massive range of music software available today make for some mind-boggling possibilities.